to make it without the city but keep the snow. help of the smudge tool and a texture. The scan is wonderful. And very nice use of textures and brushes. Oh very orange one of my favorite colors.awsome use of textures and such a cute wall deserves a fav! Plenty of detail I can see, and this wallpaper shows me the colors one can fiddle with and fiddle into when one looks at it in detail, great wallpaper. while it was downloading those clouds blew me off, completely, they look like pasted from a stock in overlay/screen mode and nothing more...however I do like how you cleaned/added detail to everything else...I just think you should the next time use some brushes on the clouds to take off that fake look. Why won't anyone understand my love?! 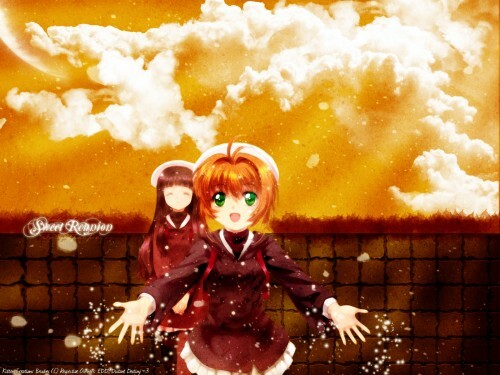 I've been a major CCS fan for like 4ever! And this is a shiny nice wallie! Thanks for your contribute, yeah! Great wall! Nice bg. Thanks for sharing.